I worked on the studios the last couple of days, deepening the colors and adding a little bit of ink. I don’t know if you can see any difference, but I think they are improved. I think I like Studio 1 the best. There is an art gallery show fairly close to me and I am debating putting it and something else in. The cost is relatively low and I don’t have to mail it. 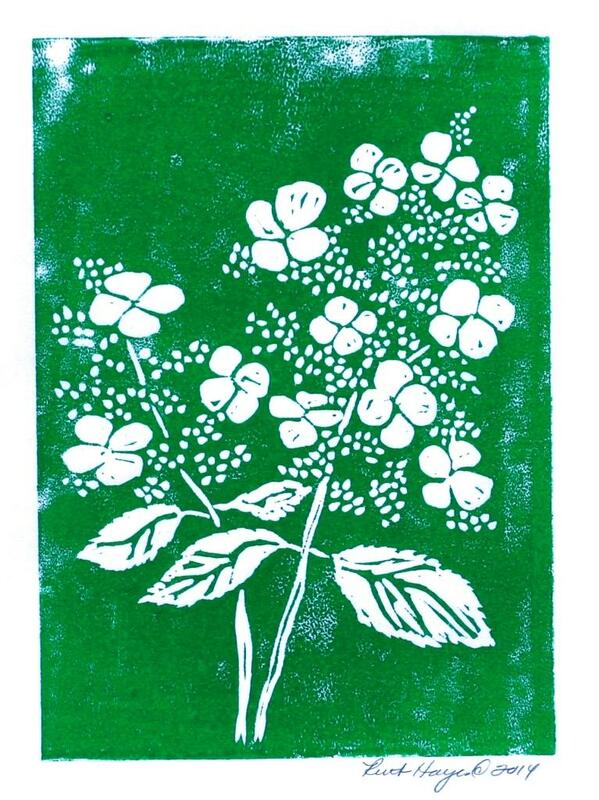 Next up is a hydrangea linocut. I have a two hydrangea trees in front of my house and they have the most unusual flower spike. Only a few of the buds actually flower. I dried several branches last fall and they are quite lovely. 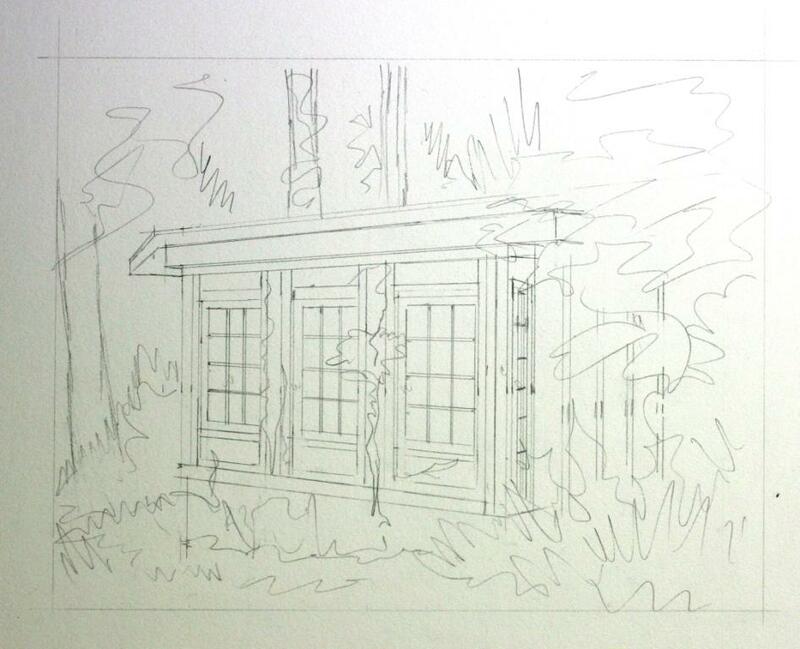 Here is the watercolor start of studio 2. I am going to let it sit a couple of days and then work more on the shadowing. I’ll repost it and studio 1 when I am happy with the final touches. I like the Japanese maple in the corner. 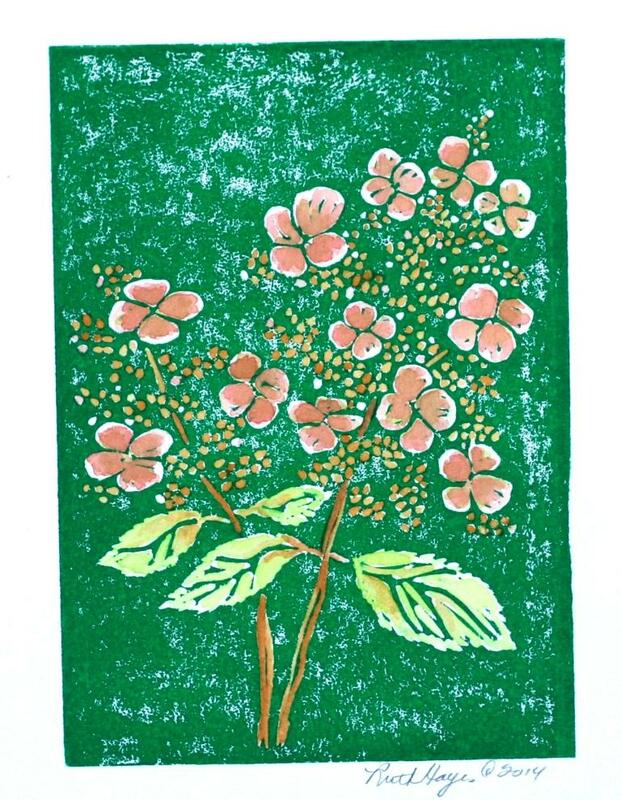 It adds a wonderful pop of warm reds and muted greens. As for the studio, I am sure the choice of paint was all Ruth’s. 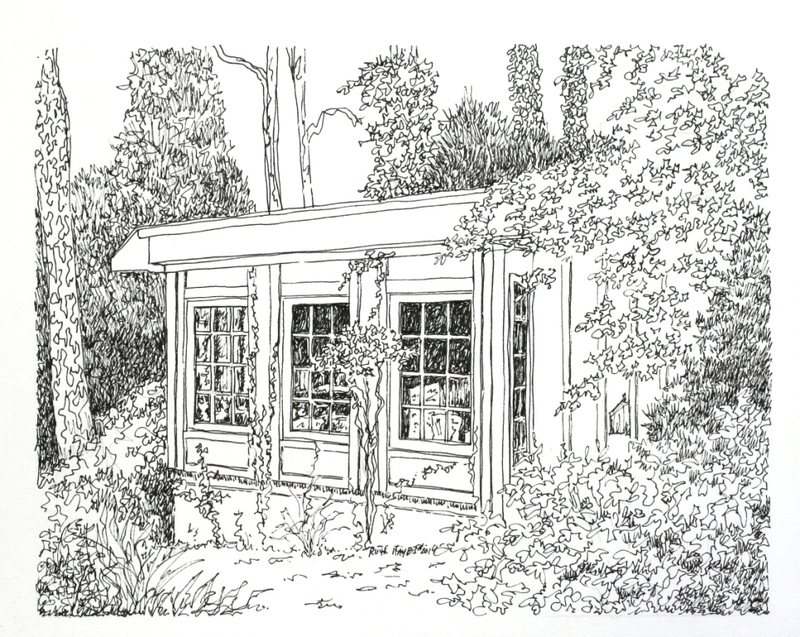 As an artist, she would have considered what she wanted to see from her kitchen, walk up to, and work inside of. She has been a remarkable artist over a 60 year career. 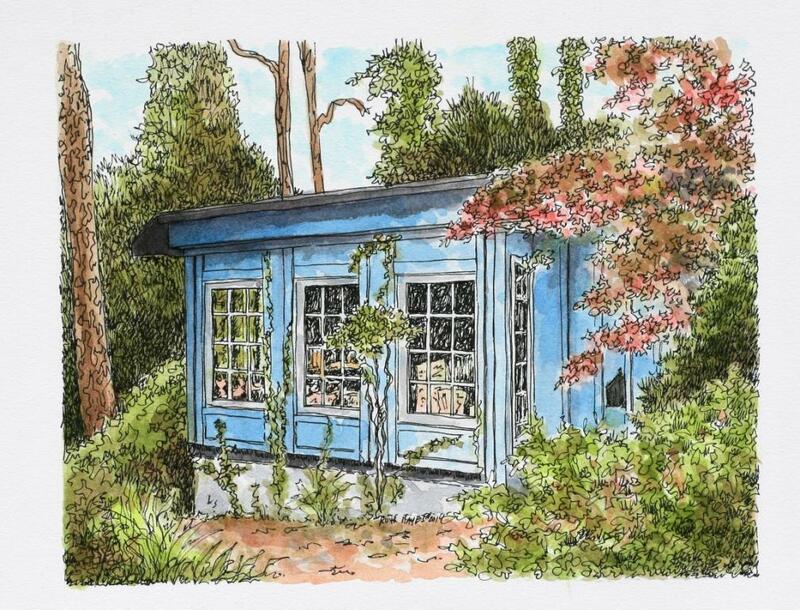 Here is Ruth’s studio inked in. I tried to keep the black and white values the same as for studio one and will color it with the watercolors. The board and batten is a sky blue color and there is a rolled tar paper roof overhang. The spring flowers were just coming into bloom so I will put a few in. I am keeping the studio one within sight so I can match the landscaping somewhat. They are going to make a nice matched pair. I received word Monday that “Boomer” made it to his new home and was well appreciated. It’s always a relief to hear that a picture arrived safely and that they feel I captured the essence of the animal on paper. 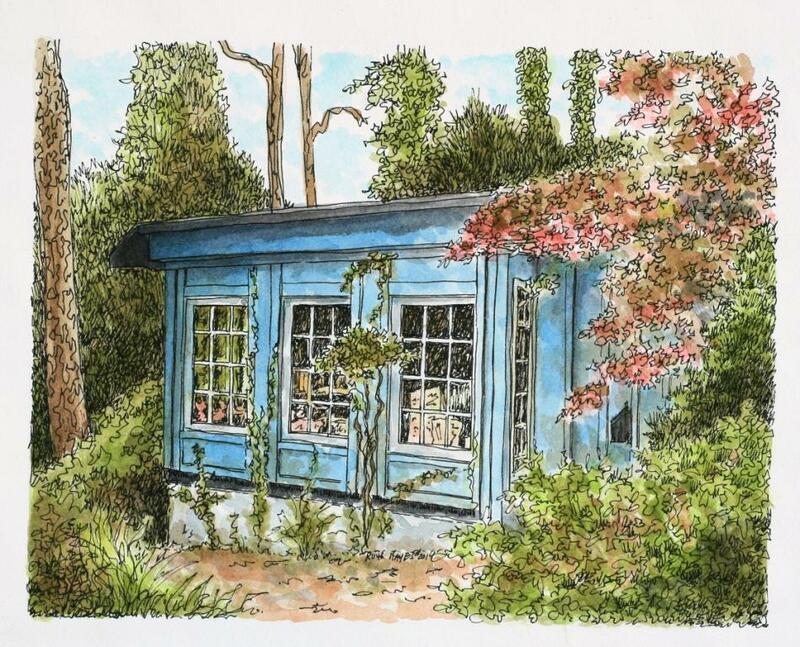 After finishing the two dog portraits, I’m now back to the artist Ruth Laxson’s second studio building. I’m working on the same size board as the first one so the two will be a matching set. Both buildings are small, intimate structures so it works out well. This one has board and batten siding painted in an almost robin’s egg blue and a tar paper roof. As you can see, it has large colonial style windows on two sides. 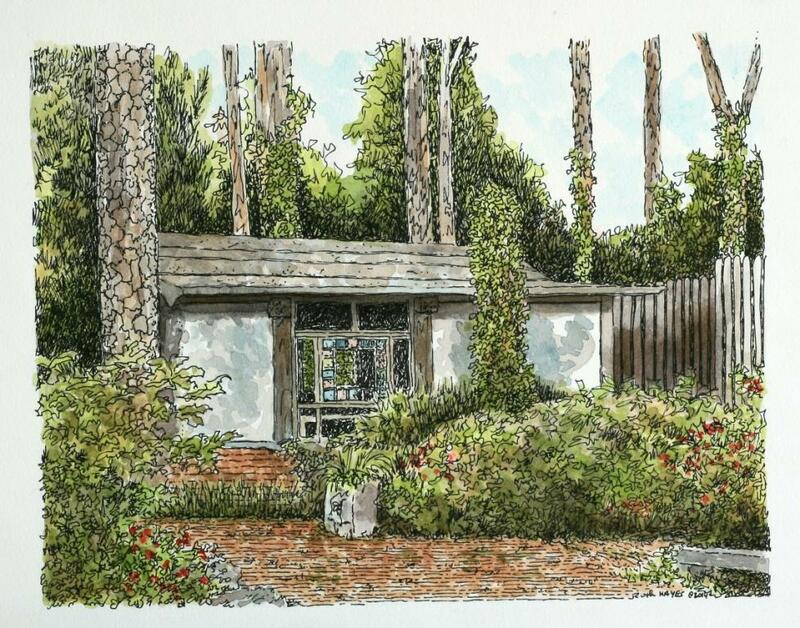 It, too, is nestled in her wooded and flowered back yard, only about 15′ away from the first one. At one time they held her printing presses, but now, sadly, she is no longer able to work. You should look her up on the net and see what a wonderful artist she is. she has quite the name in lexicographical artwork.